The Discovery Trekking travel towels are different. The Ultra Fast-Dry Towel does not look or feel like a towel. It looks and feels more like a piece of fabric. There is however no question about it, it is extremely water absorbent, quick drying, odor resistant and lightweigh... or everything a good travel towel should be. Our Ultra Fast-Dry Towel is size Large (34" x 58") and weighs only 250 grams (0.55 lbs). This is three times less than the cotton bath towels we normally use. This makes a lot of difference when space or weight is limited… as it usually is when travelling. Using travel towels feels different from using traditional cotton towels. It usually takes few uses to get used to it. The Ultra Fast-Dry Towel is no different. It did take us few uses to get used to it. The towel is absorbent and efficient to use. You do not have to rub the skin, you rather pat the skin dry (which actually much faster when you get used to it). Or as Discovery Trekking Outfitters puts it, the "moisture-management material pulls moisture from your skin so you dry faster ". The special high tech fabric promotes rapid evaporation, meaning the Discovery Trekking travel towel dries much faster than most other towels. Not having to pack wet towels is highly beneficial when travelling, especially when outdoors, like camping, trekking, swimming, etc. Guess most of us remember how unpacking wet towels smells like. Say no more! The Ultra Fast-Dry Towel incorporates special odor resistant technology. Pure silver has been micro-encapsulated in the yarns but silver inhibits the growth of odor-causing bacteria. It is safe and natural and lasts for years. The towel stays fresher and smells better between washing, another highly beneficial feature when travelling. 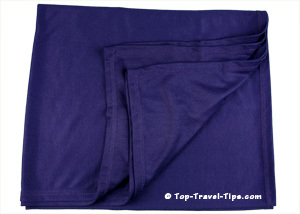 The Discovery Trekking travel towels come with SPF rating of 15 – 40 (depending on the color). Meaning you can use them to protect you from the sun if needed, e.g. by using it as headgear, or shoulder wrap. This can be extremely beneficial when travelling in hot and sunny climate. They are also great for the beach, as sand does not stick to them. Where To Buy Discovery Trekking Travel Towel? We recommend Amazon as a good place to buy your travel towels from Discovery Trekking Outfitters. When you buy for certain amount, you get free shipping.